Deer management and the QDM goes far beyond targeting upper age class bucks. From day one, The Quality Deer Management Association has been sharing the importance of harvesting the correct number of antlerless deer each year. With good reason too! Do you participate in this activity each year or do you sit and wait solely on a target buck? 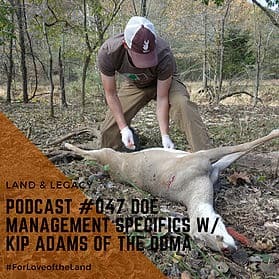 No matter your answer, this week we discuss the strategy, science, and just plain fun of harvesting antlerless deer each season with Kip Adams of the QDMA.